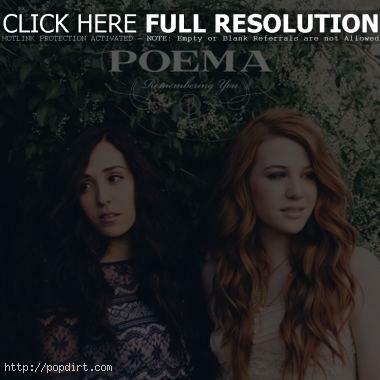 Poema is set to release their full-length debut ‘Remembering You’ on September 11th on Tooth & Nail Records. Sisters Shealeen and Elle Puckett’s parents have been playing in bands since the two were toddlers, and the Albuquerque, New Mexico natives are continuing the family tradition. “We are always growing lyrically and musically,” Elle explained, “and we’re comfortable in that.” ‘Remembering You’ focuses on relationships, and shows the sisters penning many of their own stories into the LP. In the past few years, the girls have fallen in love all over again with country music – the new and the old – and that sound is evident on the album. “It’s the story-telling,” Shealeen said, “it draws you in. We write like that and connect with those types of songs.” The girls found inspiration from the likes of Patsy Cline and Nickel Creek to John Mayer and Loretta Lynn. Listen to the track ‘Clean Getaway’ via Soundcloud below.